It’s time to revisit this “old” topic in light of new data. This article was originally published online in January 2012. One of the things that can happen with scleral lenses is some fogginess after several hours. After studying many hundreds of OCT images of scleral lenses, we have hypothesized the source of the debris fogging to be a combination of secretory products from conjunctival and meibomian glands in the pre-corneal tear film. The elimination or reduction of this debris is largely a design issue. The landing zone of the lens must be such that excess conjunctiva does not become trapped inside the lens chamber, and the lens fit in such a way to reduce or eliminate translational movement during blinking. The blinking action tends to serve as a pump. Unfortunately, with so much emphasis on clearing the limbus, the entrapment of secretory products is virtually guaranteed. A loose fitting lens can act to pump debris under the lens. This will occur very quickly. Entrapment of conjunctiva underneath the lens can cause further secretions to accumulate. Polar lipids are present in the tear film that may or may not have their origin in the Meibomian glands. 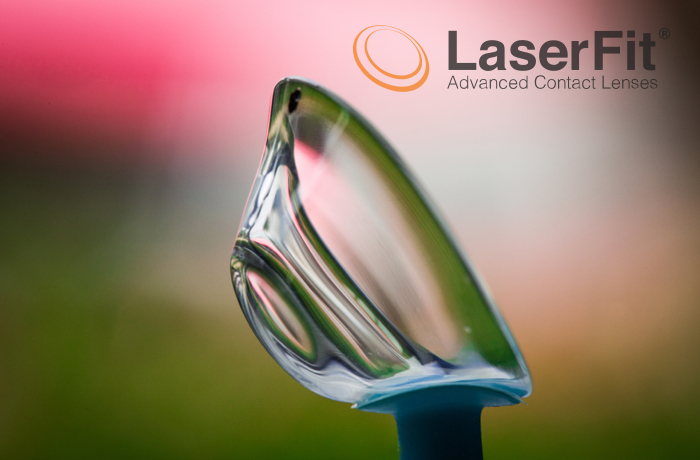 While reducing the tear path thickness is of benefit (thinner fog layer to look through), the most useful approach for us is to make sure the lens does not translate, and to carefully control the location of the lens landing zone to keep the conjunctival encapsulation to a minimum. Sector control of the landing zone is of great benefit, and is a unique feature of our Laserfit process. Of course, the addition of a CMC thickening agent such as Celluvisc to the lens chamber can also be beneficial. While fogging cannot always be eliminated, it can be controlled in many cases.